This is a Guitar Intrumental album, loaded with soulful, melodic blues guitar & strong songwriting. “Nice tone, excellent chops & good taste. He has a lot of talent. A strong guitarist, nice power blues solos, classy tone, elegance in his playing. Very classy player”. “Great guitar player, great tone”. “A star! Genuinely special. Incredible strong knack for writing. An A&R dream”! “He can belt out gritty blues ala Stevie Ray Vaughan one minute, & turn around & deliver a sweet piano laced pop ballad ala Eric Carmen the next! Definitely has an advantage over most musicians”. 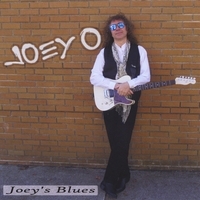 “Joey O is a guitarist’s guitarist. Smoking guitar solos, succulent guitar tone. Emotion packed, impeccable guitar technique”. “Charismatic, mesmerizing & guitar virtuosity. A stellar guitarist. One of the best blues guitarists on the national scene”. “He looks like rock legend Jimmy page, he plays like blues legend Stevie Ray Vaughan. A blistering guitarist”! “A phenomenal guitarist! An incredible guitarist. A star”! “Unique guitar style, extremely compositional. A brilliant song writer”.